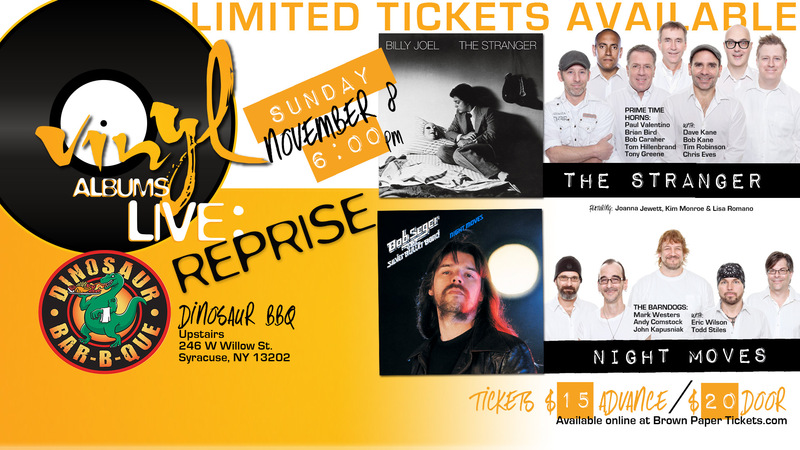 Join us on Sunday, November 8, 2015 for a special limited engagement at the upstairs of Syracuse’s Dinosaur Bar-B-Que! Reprise live performances of two iconic rock albums: Billy Joel’s The Stranger and Bob Seger’s Night Moves. Featuring Syracuse’s premiere bands Prime Time Horns and The Barndogs, joined by a collection of the area’s top musicians. Announcement of the line up for our January 2016 show, Vinyl – Albums Live: VI, will take place between albums. Released in September of 1977, The Stranger was Billy Joel’s fifth studio album and is considered his critical and commercial breakthrough effort, spending six weeks at #2 on the US Billboard 200. Featuring the singles “Just the Way You Are”, “Movin’ Out (Anthony’s Song)”, “Only the Good Die Young”, “She’s Always a Woman” and “The Stranger”, the album remains Joel’s best-selling non-compilation album to date and was ranked number 70 on Rolling Stone magazine’s list of the 500 greatest albums of all time. Vinyl – Albums Live musicians performing The Stranger are Bob Kane (drums), Dave Kane (bass), Tim Robinson (guitar), Chris Eves (keys/accordion) and Jon Kane (percussion), joined by Prime Time Horns musicians Brian Bird (sax), Tony Greene (sax & flute), Bob Caraher (piano/keys), Tom Hillenbrand (guitar) and Paul Valentino (vocals). With backing vocalists Joanna Jewett, Kim Monroe and Lisa Romano. Bob Seger released Night Moves in October of 1976. It was his ninth studio album and his first with the Silver Bullet band. Night Moves included the singles “Mainstreet”, “Rock and Roll Never Forgets” and “Night Moves”. It peaked at #8 on the Billboard 200 in 1977. Vinyl – Albums Live musicians performing “Night Moves” are Barndogs musicians Mark Westers (guitar), Andy Comstock (lead vox & bass) and John Kapusniak (keys), joined by Eric Wilson (drums) Todd Stiles (guitar) and Chris Eves (keys). With backing vocalists Joanna Jewett, Kim Monroe and Lisa Romano. Any remaining tickets available on the night of the show will be $20 at the door.